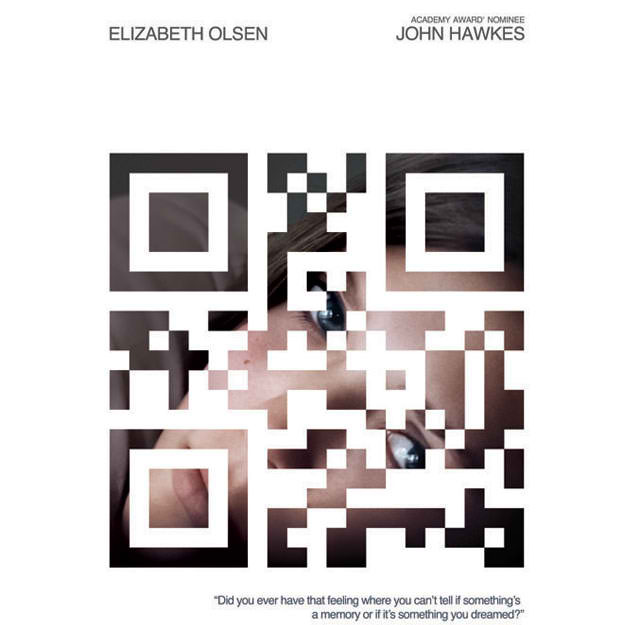 For the first time a movie’s trailer is being released via QR code. Oh, sorry. The title of this post already said that…. well, except for the first time thing. 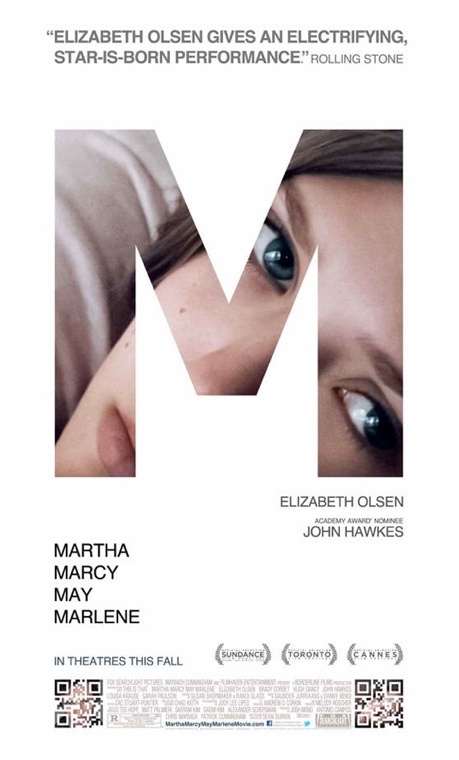 The name of the movie is Martha Marcy May Marlene and it’s starring Elizabeth Olsen. Yeah, you’re right, that’s a lotta’ M’s and I’m not even sure if that is one person or four different chicks. Anyway, the movie is supposed to be about her getting confused about her memories and dreams… which are which. Ya’ know, that kind of “Is this a dream? Or are my dreams really my real life?” philosophy stuff. I like philosophy, but the theory could get kind of confusing. If that was a question that was supposed to get answered, I wouldn’t know if my real life or dreams sucked more than the other. Lol. #InceptionMuch? Click Here to watch the trailer. Wait. Don’t. Scan the QR code! After all, that is the point! P.S. This is a really great idea. I might steal it for a project I’m working on. Like “Spirit Fingers”, QR codes are GREAT! I love this commercial. It’s really imaginative and cute how all the characters from all the different historic events try to wake him up for his finals he is about to miss. Very inventive. Great production. Good job, Coke. Wow. What is he doing? Did this actually air on TV? If it did, I never saw it. It’s funny… a little. Isn’t it crazy how stars always end up in commercials… about PEPTO BISMOL? Come on, Ken Jeong. Lol. I like this commercial and I really want a red Wii. I think it would really fit in with the design in my apartment and also… I LOVE video games! “We play each other… to decide who’s doin’ the chores.” Yeah, uh-huh. Ok, Mom. I’m probably not getting one. But I want one. This thing is so cool and not really that expensive at all… compared to a lot of other cameras. The video / commercial is kinda’ lame, but the ending is funny and the producer did make his point. So, next time something you think is so incredibly awesome OR CUTE happens that only YOU will think is awesome or cute, make sure you don’t forget to capture it with the Sony Bloggie Touch. I’m a sucker for Mario. Brings back memories. Makes me wanna’ get one. (Tear). Oh… and I love the commercial, too. Great advertising. At first, the “Can I get a HOT TUB? !” State Farm commercial was my favorite. But I just saw this one five seconds ago and just had to go and Youtube it. “Oh. So, this is what you like. Mmmmhmm.” Lol. Really?! Lol. I don’t really like the tiles on these new Windows Phones even though the updating thing is pretty cool, but the commercial… is funny as hell. Only because this sort of thing actually happens… to EVERYONE… iiincluding ME. Lol. I love awesomeness and when I find it, I will show it to you... at random. Fragments of random... random awsomeness. :P Stay tuned! And please FEEL FREE TO COMMENT OR LIKE SOMETHING... ANYTHING. LOL. Happy surfing. And ciao random readers! What's THIS about? Oh nothing... just a bunch of random stuff I find on the internet that I feel is noteworthy enough to blog about. What's blogging? Well, it's kinda' like this free (sometimes) online podium for your fingers (the typing ones) that allows you to express your (or I should say my, 'cuz this about ME, right?) every thought on whatever thing, subject, or person you will ever feel the need to yap about. And it's great. You know why? Because even if people DON'T read it... at least you get the chance to vent. In my case, at no point in time have I ever had a job that is anything (except Apple) remotely close to any of the skills I possess and am dying to therefor, utilize. I happen to be in the Arts field and there is nothing here at all except NASA. So even though this may not be a paying gig, I'll take it! Did It Make The List? Small Business Start-up. Please Help.